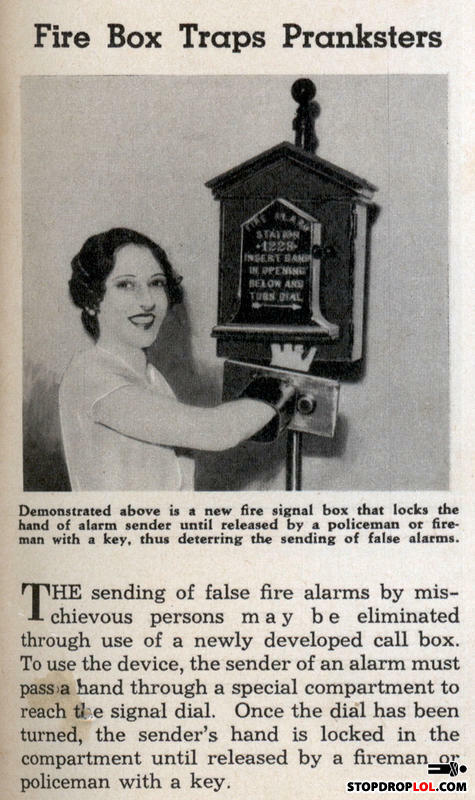 "And in the case of an actual emergency, the chance of the good citizen who reported the fire being trapped and burning alive is increased 94%! Optional fireproof 8mm camera module records the hilarity." and case of real fire scream until horse and gnaw off arm! Make every fire you spot into a moral dilemma! I bet a TON of people died in fired back then. Couldn't you just reach your hand AROUND the compartment and turn the dial? It doesn't appear that you are unable to get to the dial without going around it. they have those in prague. seriously. Modern day witch hunting. "Just in case.."
Hoarse. Not Horse. This a "lol" all in it's own. Good enough for pointless inventions!!!!! stick your enemies hand in to get him in trouble with the police! *I forgot but you wana build a fort. Moral: This has to be the one of the worst pickup lines in history.